Profile Smart™ 270 Easy Height Elongated dual flush high efficiency toilet (HET) with integrated sink adds a unique style and water conservation to any bathroom. The Profile Smart is the latest addition to the Caroma™ line of dual flush toilets featuring an average flush volume of .90 gallons per flush, the lowest water consumption of any toilet in the market today. The Profile Smart saves money while preserving the world's most valuable resource – water. 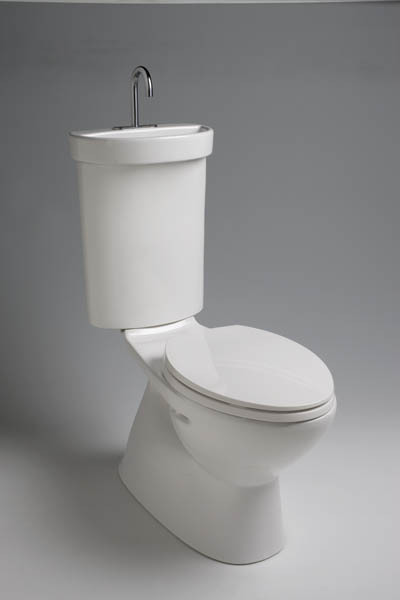 This complete toilet consists of tank (840420W), bowl (609120W) and seat (326307W). View the promotional brochure. The Profile Smart toilet is also available in round front plus. • Integrated sink for enhanced water savings. After flushing, fresh cold water is directed through the faucet for hand washing and drains into the tank to be used for the next flush (greywater recycling). The faucet is not equipped with an independent tap, so the toilet must be flushed in order for the sink to be used.